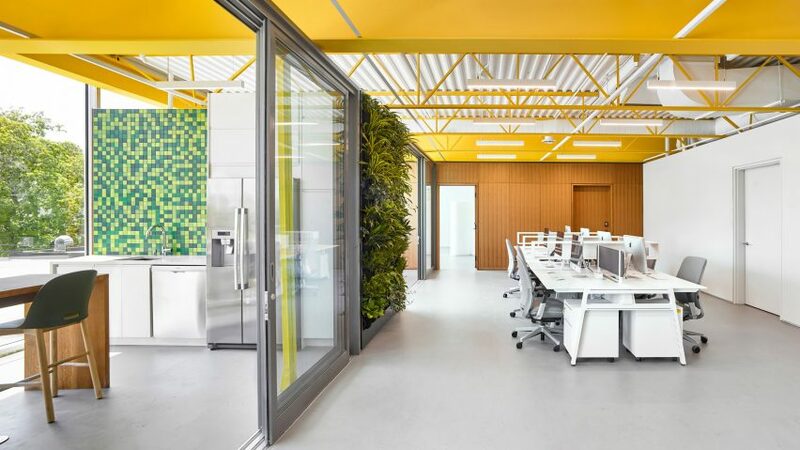 Canadian architecture firm Williamson Williamson has added administrative offices on top of a coffee roastery in Toronto, where structural elements are highlighted in bright yellow. 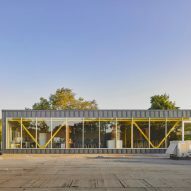 "We have done three phases of work on the building to date: the original roastery and tasting bar; a new roaster in a space in the back, cold brew/milk-based manufacturing and canning line; and the administrative office on top," Betsy Williamson, co-founder of Williamson Williamson, told Dezeen. The new, rectangular addition is located on the roof of the existing structure and measures 2,368 square feet (220 square metres). The warehouse below is 11,277 square feet (1,043 square metres), creating a dramatic visual difference when viewed together. 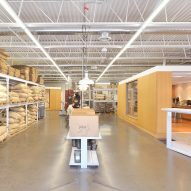 "Having used every inch of the available ground floor for roasting and production, the only option to house the growing business was to add a second level," said the studio. The office volume is built from concrete walls at the rear and sides, and a 67-foot (20-metre) glass exterior wall that faces south for all-day sunlight. 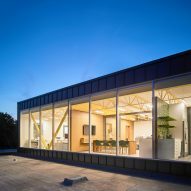 "An office addition was conceived that would float above the existing facility so that columns would not penetrate the space below and disrupt the already densely programmed ground floor," said the studio. 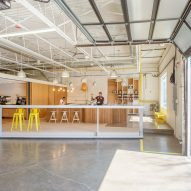 A structural truss along the southern side of the building is painted yellow to reflect Pilot Coffee's branding. The same hue is also used across exposed beams, open-web steel joists, and hangers. Walls are white, floors are grey, and a corrugated metal ceiling is left exposed and painted to match the vertical surfaces. Feature walls are clad in white oak panelling or pixelated green tiles, chosen to soften the industrial interiors. The layout comprises various rooms for working, meeting and eating. 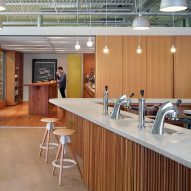 Administrative desks are at the centre of the office, connected to a lunchroom and a "cupping room" for coffee tastings and entertaining guests via sliding glass doors. On the opposite side are desks for executives and a meeting area. 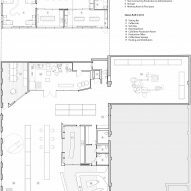 Three bathrooms and a storage room complete the floor plan. Another feature wall is covered in plants including ferns, devil's ivy and philodendron – all which thrive indoors. Dark green Alfi chairs by British designer Jasper Morrison fill the lunchroom. The facility is located in the east of Toronto, in one of the city's Employment Areas. These sites are reserved strictly for business and economic activities. 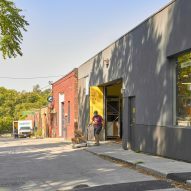 Pilot Coffee sits in between a residential street and Greenwood Rail Yards, and is considered an important revitalisation project in the neighbourhood. "Important elements such as manufacturing, warehousing, and goods distribution are located almost entirely in Employment Areas, and provide for a broad range of jobs and a diverse economic base that helps the city through difficult cycles in the economy," said Williamson and Williamson. 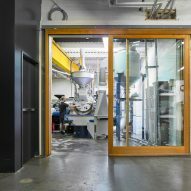 Other projects in warehouses in Toronto are a community for homeless youths by LGA and a Sidewalk Labs office by Lebel & Boulaine. Photography is by Scott Norsworthy.